As educators we all know about Bloom’s taxonomy and how it can help us scaffold learning by building a base of knowledge while supporting and challenging our students to apply what they know in other situations. Bloom’s taxonomy, now over 50 years old, was updated in 2000 by Lorin Anderson and David Krathwohl. Krathwohl, who worked with Bloom on the original taxonomy, worked with Anderson and a group of experts to transform Bloom’s taxonomy into an active and modern reflection of what we know about cognitive psychology, learning, and metacognition. Dr. Leslie Owen Wilson gives a wonderful overview of the change and compares the revised taxonomy to Bloom’s original. Based on the revised Bloom’s, Andrew Churches created Bloom’s Digital Taxonomy. His wiki, educational origami, details all of his work, presentations and resources for integrating the digital taxonomy into the classroom. 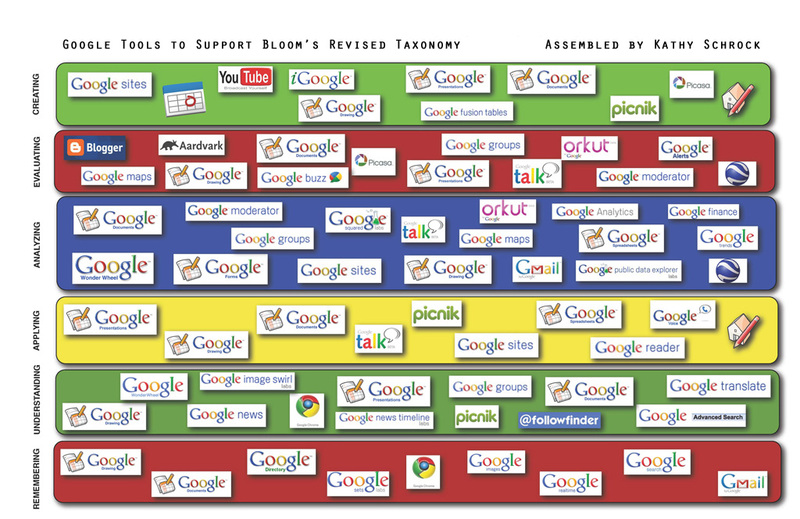 Below is a summary map of Bloom’s Digital Taxonomy. Click on the image to see a larger version. As always, Kathy offers some great tools and ideas for using Google Apps to reach all levels of Bloom’s Digital Taxonomy. You can see some of them here. I hope some ideas are sparked by Bloom’s Digital Taxonomy. I look forward to sharing these wonderful tools with you! @susie_dent Excited to listen to this on my evening commute! You are a fount of lexicological knowledge! @Educate_Coach It was a bit over three weeks. I was nervous, too. Hang in there! @i3algebra @vianneygriffins I love demonstrating this with PB&J! It really makes an impact. Adventures in Minecraft Pt. 3…DMCA? What! © 2017 TechEdOnline. All Rights Reserved.